Asclepias tuberosa helps the pollinators. Alas, they need all the help they can get. 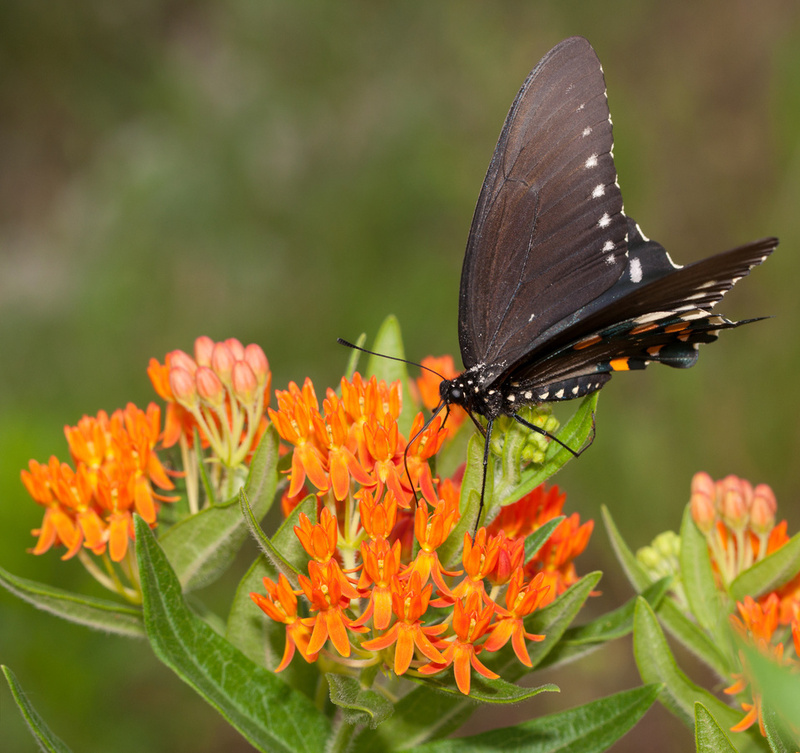 A perfect plant does not exist, but Asclepias tuberosa, commonly called the butterfly weed, comes close. If the native of the eastern United States tolerated shade – which it doesn’t – it would be perfect. Still the long-lived herbaceous perennial comes close enough to perfect that the Perennial Plant Association named the butterfly weed its Plant of the Year for 2017. All members of the Asclepias family support bees, hummingbirds and butterflies – and are essential for the survival of the monarch butterfly. Asclepias tuberosa is the best behaved in polite company. “Butterfly weeds is a perfect selection for full-sun meadow or prairie gardens, as well as formal to semi-formal urban gardens,” the association said in naming the winner. My regular readers know this, but I’m including it for those who were drawn in to this column by the pretty picture and catchy headline. Pollinators – a group that includes bees, butterflies, moths and hummingbirds – are in trouble. The population of monarch butterflies – which require Asclepias plants for food and laying eggs – is way down. Honeybee colonies are collapsing. Native bees – of which there are more than 270 species in Maine – are also struggling. Part of what home gardeners have to do to help pollinators – without which we cannot produce most fruits and vegetables – is to plant more native, pollinator-friendly plants. The butterfly weed fits the bill perfectly. “The butterfly weed is native, attractive, very tolerant of poor soils and pretty undemanding to grow,” said Mary Mixer, a plant grower at Skillins Greenhouse in Falmouth. The plant produces bright blossoms – usually orange, although they can be red or yellow – on 3-foot stems, and spreads about 2 feet wide. Each flower has five petals that hang down and five upright petals called hoods, the Perennial Plant Association said in its announcement. I never looked that closely, but I intend to when ours bloom next spring. Butterfly weeds bloom from early spring to mid-July and produce a small fruit, also called a follicle. In a formal setting, gardeners are advised to cut off the spent blossoms to promote a second bloom later in the year and prevent reseeding, but if you are going for a natural-meadow look, let it seed. In either case, it is best to leave the plant standing through the winter and cut it down in the spring. Young plants produce a single stem, but as the plants age they send up side shoots. Asclepias tuberosa is hardy to Zone 4, which includes all of Maine except north of Houlton in Aroostook County. Unlike other Asclepias varieties, tuberosa makes an excellent cut flower – in part because it lacks the free-flowing sap that the other kinds have. You should cut the flower when more than half the flowers are open, because they won’t continue to open once you put it in a vase. You can plant the butterfly weed either as a plant grown in a nursery or with seeds, but Mixer recommends buying plants. Online instructions for planting seeds say you have to cold-condition the seeds and then start them inside to get flowers next summer. You can plant seeds next spring, but the seedlings look inconspicuous and can be damaged, and you won’t get flowers the first summer. Because mature plants have a deep taproot, they don’t transplant well – so choose the location carefully. The plant has few disease or pest problems; monarch butterflies will chew on the leaves but usually not strip them, as they do with other asclepias. Deer usually leave asclepias alone. If you want to go all out in helping monarch butterflies, also plant the two other asclepias varieties native to Maine. Common milkweed, or Asclepias syriaca, grows 5 to 8 feet tall, depending on location, in ditches and fields, has large pods of seeds with silky attachments that blow them from place to place. They were everywhere on untended properties when I grew up in Farmington, but I don’t see them as often now – which might be one of the reasons that monarch butterflies are suffering. If you do get monarchs, the leaves will be stripped. It might not be attractive, but it means the plant served its purpose, and it will come back the following year. If you have a shadier site with moist soil, try Asclepias incarnata or swamp milkweed. It has pink blossoms from June to October and grows up to 5 feet tall. The butterflies will thank you and butterflies are, as I have read, the flowers of the air.